In recent years, Cambodia has been experiencing rapid growth in the Financial Technology (or more commonly referred to as “Fintech”) industry. Both banking and non-banking institutions have introduced a wide array of payment and money transfer options for individuals and businesses. Some of the more notable market players include Wing, True Money, Asia Wei Luy, PayGo and PiPay. The National Bank of Cambodia (“National Bank”) has responded to these developments by issuing the Prakas on the Management of Payment Service Providers on 14 June 2017. This regulation makes the provision of payment services through payment transaction accounts (e.g. debit transfers and electronic payment systems) a licensed activity. In addition, such payment service providers must also seek approval from the National Bank prior to providing such services. a service provider for clearing and settlement of debit and credit card payments. 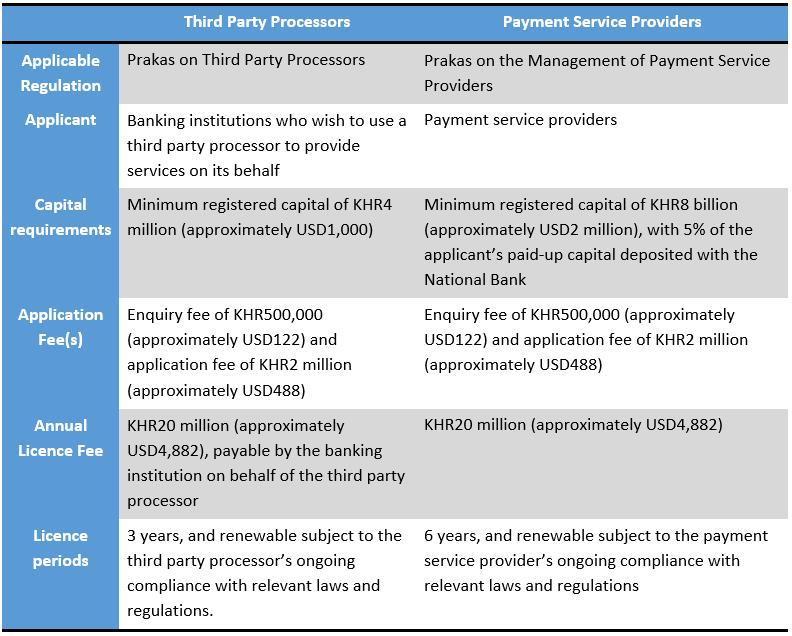 Under the Prakas on Third Party Processors, such third-party processors must “tie-in” with a banking institution in the provision of their services. The introduction of the Prakas on the Management of Payment Service Providers effectively expands the ability of non-bank players’ ability to operate independently in Cambodia. In its report Accelerating Financial Inclusion in South-East Asia with Digital Finance published in January 2017, the Asian Development Bank (“ADB”) concluded that digital financial solutions could play a significant part in closing gaps in financial inclusion. While, by itself, it cannot entirely close these gaps, ADB estimated that the cumulative effect of digitally driven acceleration in financial inclusion could boost Cambodia’s GDP by as much as 6%.